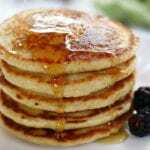 Oat Flour Pancakes recipe creates healthy and fluffy pancakes that are completely irresistible. Super easy to make, very fast and absolultey no guilt. As somebody who loves to cook and adores all things food, I definitely have a few guilty pleasures. Some of my favorites, having an appetizer for dinner with a glass of crisp white wine (ex: Lemon Artichoke Dip with crackers or Bruschetta with baguette bread), ooey gooey Macaroni and Cheese or a really great Steak Dinner. One of my lesser known guilty pleasures is having breakfast for dinner and these Oat Flour Pancakes fit perfectly into that. My husband and I were recently discussing why breakfast for dinner is so fun. I partially think the little kid in me thinks it is getting away with something incredibly naughty. 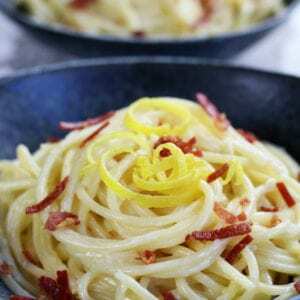 It also could be that it is an easy dinner to make that makes everybody happy. Regardless, these pancakes are an appetizing way to get your family to joyfully eat a wholesome meal. Making oat flour is extremely simple. 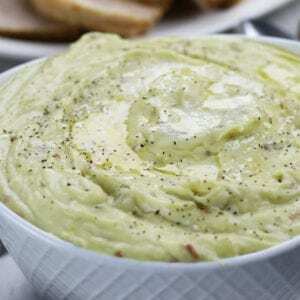 To do so, grind rolled oats in a food processor or high powered blender until they turn into flour like consistency. It really is that effortless. 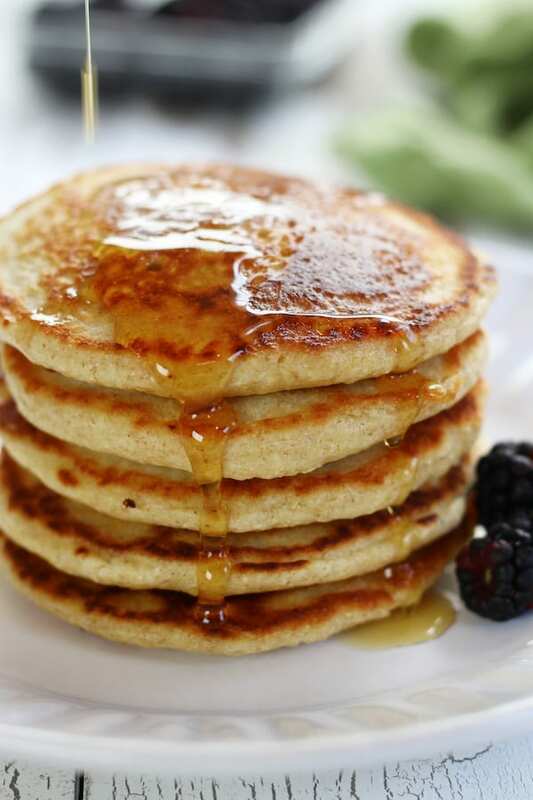 These pancakes are perfect for a quick and healthy breakfast or dinner. There are just a few steps to making. Prepare milk with lemon and add to dry ingredients along with eggs. Stir until just combined. Heat a frying pan over medium heat. Add oil to pan and cook pancakes until bubbles form. Flip and cook other side until lightly golden brown. 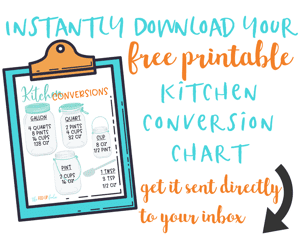 The main difference between the two, quick cooking oats (also called instant oats) are highly processed where as rolled oats (also referred to as old fashioned oats) are minimally processed. The end result using either of these oats will be very similar to one another. However, please see next section for problem solving. Batter that creates beautiful fluffy pancakes has a consistency that is easy to stir, but is on the slower side when poured. Also, the batter should be thin enough that it spreads to a pancake size, but no further. When making pancakes with homemade ground oat flour you always run the risk of batter that may be either a little too thin or thick. Read on to know how to resolve these issues. Once you have ground your oat flour, don’t put away the oats and food processor. You may find that the batter is just a tad bit too thin and this can be quickly resolved by simply grinding 1-2 tablespoons more of the oats and stirring them into the batter. If you find yourself on the side of batter that is too thick, start slowly by stirring in 1 tablespoon of milk at a time until you reach the proper consistency. Almond or Oat Milk– Start by using 3/4 cup of almond or oat milk to replace whole milk. Adjust as needed for proper consistency (see section above). Honey– Use 1 tbsp of raw honey in place of granulated sugar. 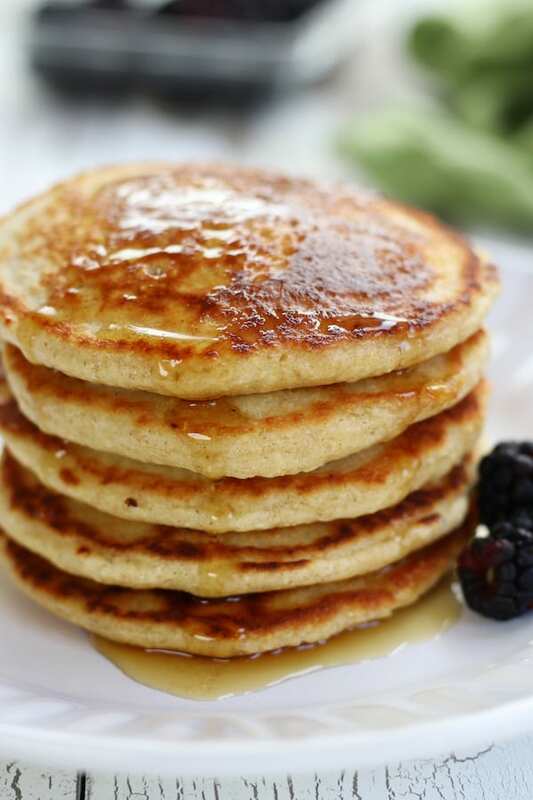 Avocado Oil, Coconut Oil or Butter– Use any one of these oils as a healthy fat source for cooking these homemade pancakes. 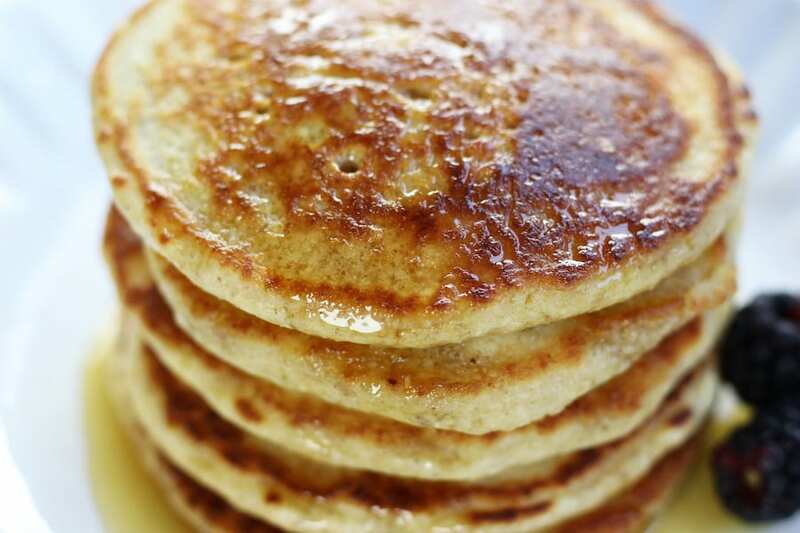 Can all purpose flour be substituted in these pancakes? Yes, the recipe would remain the same however an addition 1/2 -1 cup of milk may be needed. Why does the recipe call for lemon juice? The lemon juice reacts with the baking powder to help create a fluffier pancake. I don’t have lemon juice on hand. Is there an ingredient that is similar that I can replace it with? If you don’t have lemon juice on hand simply replace with apple cider vinegar or a white vinegar. What type of frying pan should I use? If you truly love making homemade pancakes this is the pan for you. Also, I personally recommend staying away from teflon coated pans. If using stainless steel or cast iron, 1 tbsp more oil may be needed. Can waffles be made from this batter? Yes, they just need a little more fat in the batter by mixing in 2 tbsps of oil. This is my favorite oil for most of my cooking. 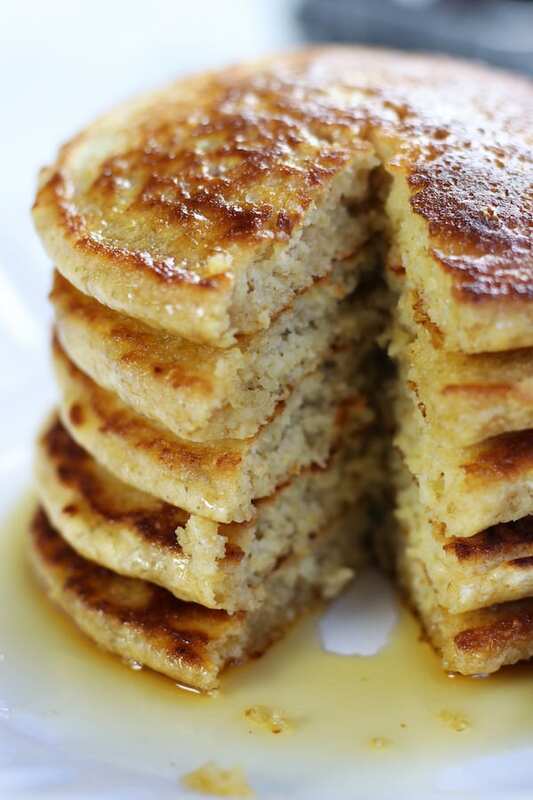 Absolutely irresistible Oat Flour Pancakes. 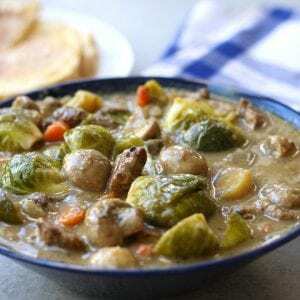 This recipe is easy, healthy and completely guilt free. Using a food processor or high powered blender, grind oats to a flour like consistency, about 2 mins. Transfer to a medium sized mixing bowl and stir in baking powder, salt and sugar. In a glass measuring cup, measure out milk and stir in lemon juice. Let sit for 5 mins. Meanwhile crack open eggs and whisk. Add milk mixture and eggs to dry ingredients. Stir until just combined. Heat a large frying pan over medium heat. Add 1/2-1 tbsp of oil. Using a 1/4 cup measuring cup per pancake, pour onto heated surface. Cook until bubbles form on pancakes. Flip and continue cooking until pancakes become lightly brown on opposite side. Repeat with the remainder of batter. **I have found time and time again that 2 cups of rolled oats equals 2 cups of oat flour.